Tourist information and guide to paddle surf, stand-up paddleboard and kayak in Santa Ponsa, Majorca, Spain. Surfing, Stand-Up Paddleboard & Kayak in Santa Ponsa is a great beach day out activity and ultimate fun for beach goers. It is also one of the best things to do in Santa Ponsa. You may take your surf or kayak day out from the meeting point at Santa Ponsa Yacht Club. 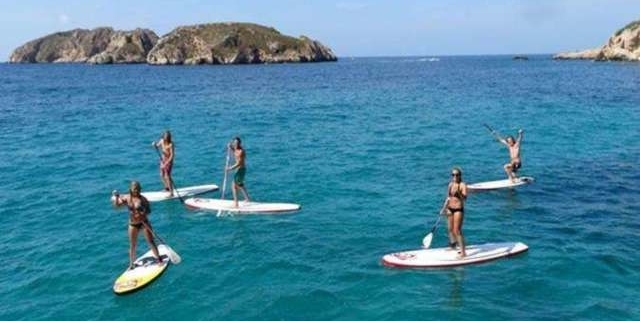 As for Stand up Paddle Surf, you may enjoy and experience the stunning scenery of Majorca from your surf board. You may also explore the Santa Ponsa coasts with its many beautiful caves, cliffs, the Malgrats Islands, the mountains of the Tramuntana and more. You may also have a chance to swim in the most inaccessible corners of the island. As for Kayak or Stand-Up Paddleboard, you may traverse the area on your own and explore many beautiful sights such as Malgrats Islands and many hidden caves and impressive cliffs as well as enjoying the chance to relax and linger in the areas you want to explore at length.